Nearly a millennium before the Inca forged a pan-Andean empire in the South American Andes, Tiwanaku emerged as a major center of political, economic, and religious life on the mountainous southern shores of Lake Titicaca. Tiwanaku influenced vast regions of the Andes and became one of the most important and enduring civilizations of the pre-Columbian Americas. Yet for centuries, the nature and antiquity of Tiwanaku remained a great mystery. Only over the past couple of decades has archaeological research begun to explore in depth the fascinating character of Tiwanaku culture and the way of life of its people. Ancient Tiwanaku synthesizes a wealth of past and current research on this fascinating high-altitude civilization. 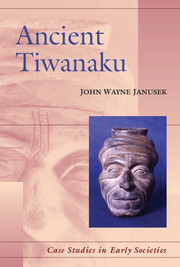 In the first major synthesis on the subject in nearly fifteen years, John Wayne Janusek explores Tiwanaku civilization in its geographical and cultural setting, tracing its long rise to power, vast geopolitical influences, and violent collapse. 1. Unraveling Tiwanaku's mystery; 2. Land and people; 3. Early complexity and Tiwanaku's ascendance; 4. The city of Tiwanaku; 5. The rural hinterland; 6. Tiwanaku geopolitics; 7. Wari and Tiwanaku; 8. Collapse and regeneration; 9. Conclusions.